Lately we have been so busy! That means our date nights have been put on the back burner as of late. However, this inspired this month’s recipe for Queen Creek Olive Mill! We’ve come up with a recipe perfect for a summer date night! Not only is it easy to make, but it also requires no cooking! 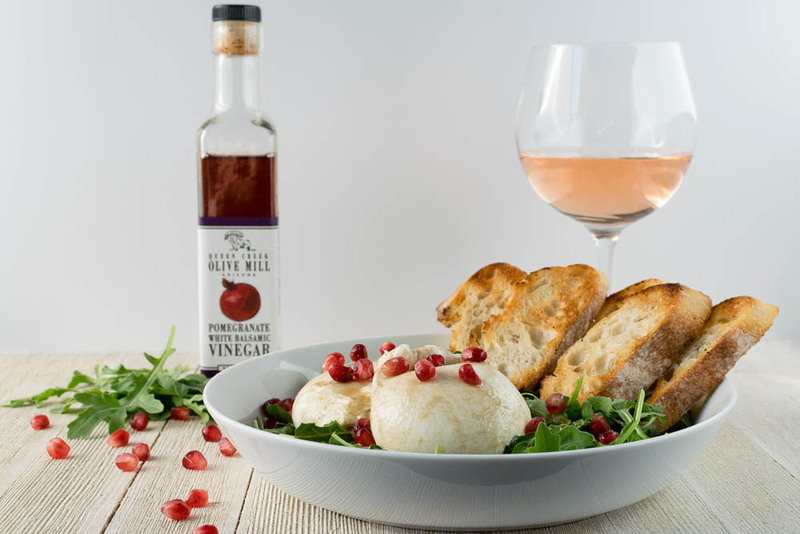 Our Burrata Salad with Pomegranate Vinaigrette for Two pairs perfectly with a nice bottle of rosé. Burrata has recently become one of our favrorite cheeses. In case you aren’t familiar, burrata is a fresh Italian cheese made from mozzarella and cream. The outer shell is solid mozzarella, while the inside contains stracciatella and cream, giving it an unusual, soft texture. Burrata is becoming more readily available at the grocery store, but is typically easiest to find in specialty stores like Trader Joe’s or Whole Foods. The mildness of the cheese allows it to pair well with the more butter vegetables like arugula. The dressing we created is super simple! What makes it special is the Queen Creek Olive Mill Pomegranate White Balsamic Vinegar. It is created from imported Italian White Balsamic Vinegar that’s blended with fresh pomegranate juice. The fruity blend is perfectly balanced with the perfect amount of sweetness and tartness. We combined with some olive oil, pomegranate seeds, and dijon mustard for a light dressing that that can go on any salad! What is your favorite date night dish? We’d love to know! Leave a comment below or share your photo with the hashtag #GeekEats! Stay tuned for next month’s recipe featuring Queen Creek Olive Mill’s Meyer Lemon Olive Oil. Combine dressing ingredients except for pomegranate seeds. Carefully add pomegranate seeds and stir to combine. Place arugula in a bowl. Drain burrata and pat dry. 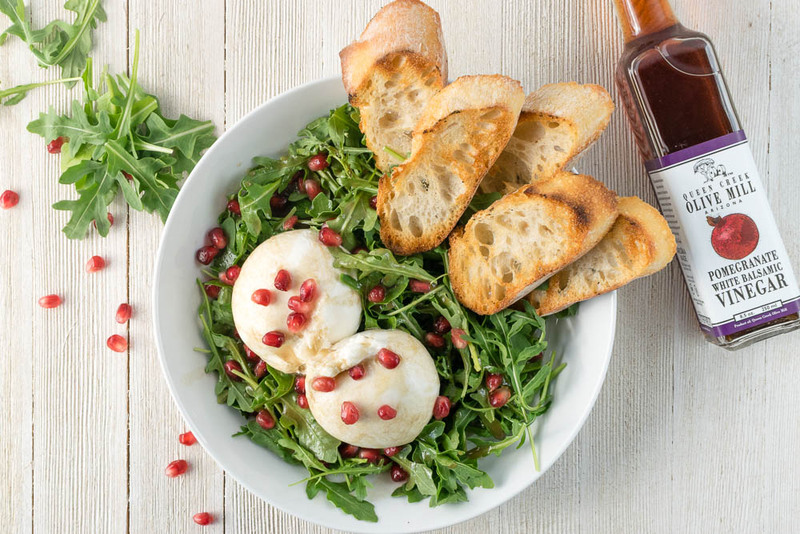 Place on burrata in bowl with arugula. Oooh! I love Queen Creek Olive Mill! I have been out there a couple of times. The food is amazing and I almost exclusively use their olive oils in my cooking. I have a bottle of blood orange olive oil that I want to use in a cake. I need to get on that! The first time i tried burrata i was really impressed by the flavor… Love your arugula- pomegranate combination here too! I adore both burrata and rose. I am so excited that it is getting easier to find. This pairing is pretty perfect and I am definitely going to try it! Love that you kept this salad so simple and let the peppery flavour from the arugula shine through all that yummy Burrata creaminess! Nothing like a good fresh and creamy burrata on top of a simple salad! I’m on my way to the Italian shop! Yum! This sounds delicious. 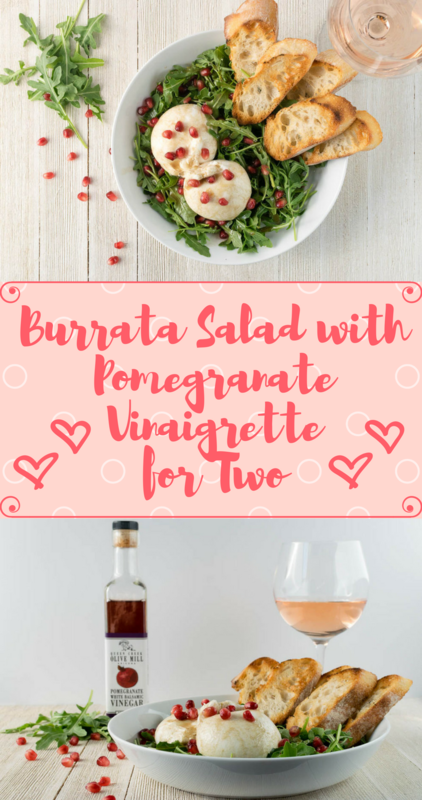 Love pomegranates…and I try to get my hands on some nice fresh burrata when I see it. I would devour this no problem. I love balsamic vinegar in salad dressing. I’m always looking for new salad recipes in summer and this salad sounds delicious. I just love burrata. It’s such an under used cheese. I love that creamy center. It’s just heaven. This is a great recipe. I love that you used pomegranate in the vinaigrette! But man, I am so jealous. We don’t have a Trader Joe’s in our area. It’s been forever since I have been to one. Burrata ANYTHING and I’m in!